This post will guide you how to extract attribute values from XML or HTML data in a range or cells in excel. How to strip values from XML or other markup in excel Cells. Assuming that you have a table that contains the content of the markup language, such as: XML or HTML markup data. 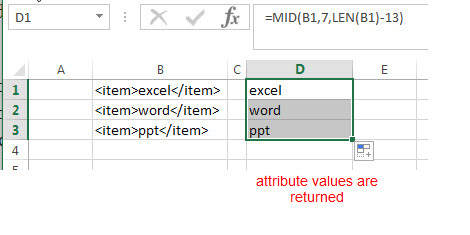 If you want to extract only attribute values from xml data, you can use a combination of the MID function and the LEN function to create a new excel formula. The LEN function returns the length of the text string in Cell B1. It returns 18. This formula returns the length of the attribute value in Cell B1, it use the length value of the cell B1 to subtract 13. The number 13 is the length of the markup containing the starting tag (<item>) and the closing tag (</item>). The length of the starting tag is 6, so the position of the first character that you want to extract in attribute value in Cell B1 is 7. And the num_chars is returned by the above LEN function as 5. So the MID function extracts the attribute value between two markup tags as “excel”. Note: you can drag the Fill Handle down to other cells to extract attribute values from other Cells (B2:B3).